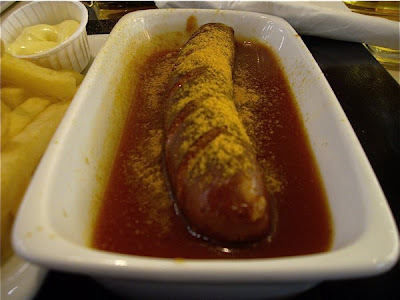 Enjoy - Food & Travel: Mmmm - currywurst!!! My friend Dagfinn Koch introduced me to Currywurst, when I visited him in Lübeck some years ago. If it hadn't been for Herta Heuwer, this simple dish would never had turned into a true German food story. I enjoyed this serving of Currywurst at Frankfurt International Airport. It consists simply of one large bratwurst immersed in tomato ketchup, mixed with curry powder and Worcestershire sauce. 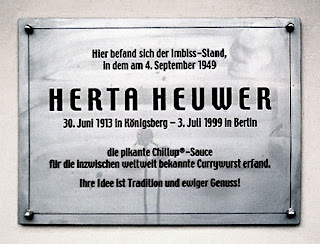 In 1949 Herta Heuwer in Berlin, originally from Königsberg in former East Prussia (now Kaliningrad), obtained the ingredients from British soldiers and assembled the first currywurst. It has since then spread like wildfire over Germany. I personally do not know why Currywurst has gained such a status. It is just an ordinary German sausage with ketchup and a few other very familiar ingredients. Or is it? To understand a culinary phenomena like this, it may be wise to pay attention to the period it appeared. The dish was created in a war torn nation, from new and intriguing ingredients introduced by conquerors (or liberators) and all this blend into a dish reminding the Germans of emotional times. "Typically German? Been there, done that!" As you mentioned in your aticle, Currywurst was invented by Herta Heuwer in Berlin in 1949 as an affordable but filling meal for the people of Berlin at a time when food was in short supply.